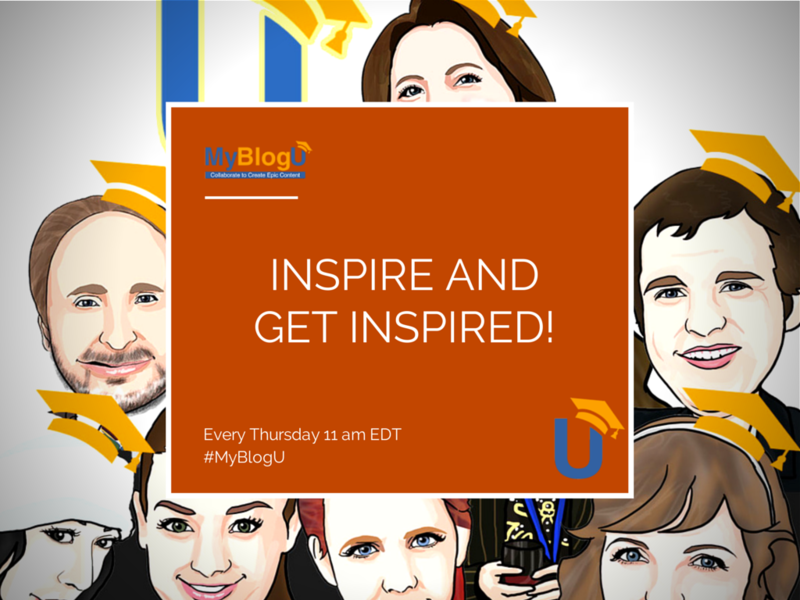 Send Ideas through #MyBlogU Brainstorm: Best Practices! 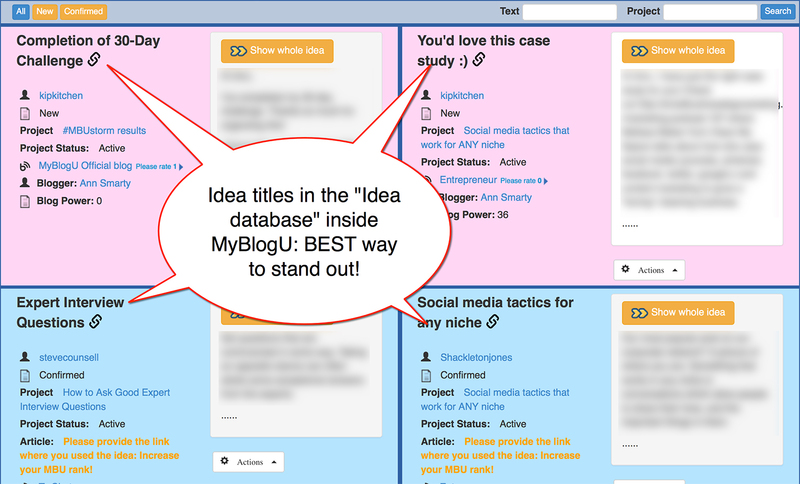 MyBlogU Brainstorm is the most fun and flexible feature we are building for the site. There are no strict rules in there (except for a few ones which are also negotiable), no set deadlines, no preferred topics or formats (we do have a few examples just to give you an idea of what to do there). Receiving ideas means finding content inspiration and also building your database of ideas (since there are no deadlines, you can keep accumulating those ideas)! 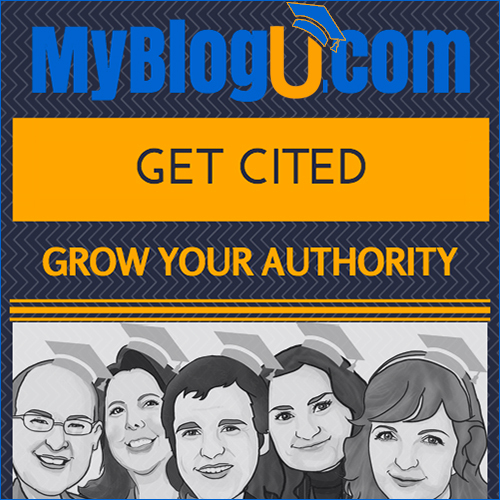 As I am getting down to a new article, I find myself opening my MyBlogU idea collection every time: to find related links, thoughts and tools. MyBlogU Brainstorm is making me highly productive with writing! Sending ideas means getting inspired as well! Oftentimes I come across questions that make me think “Wow! I’d love to know that as well” or “What a brilliant idea”. MyBlogU Brainstorm broadens your outlook and opens your mind! Sending ideas also means growing your MBU user rank, building connections with those people you help and overall becoming a better writer. 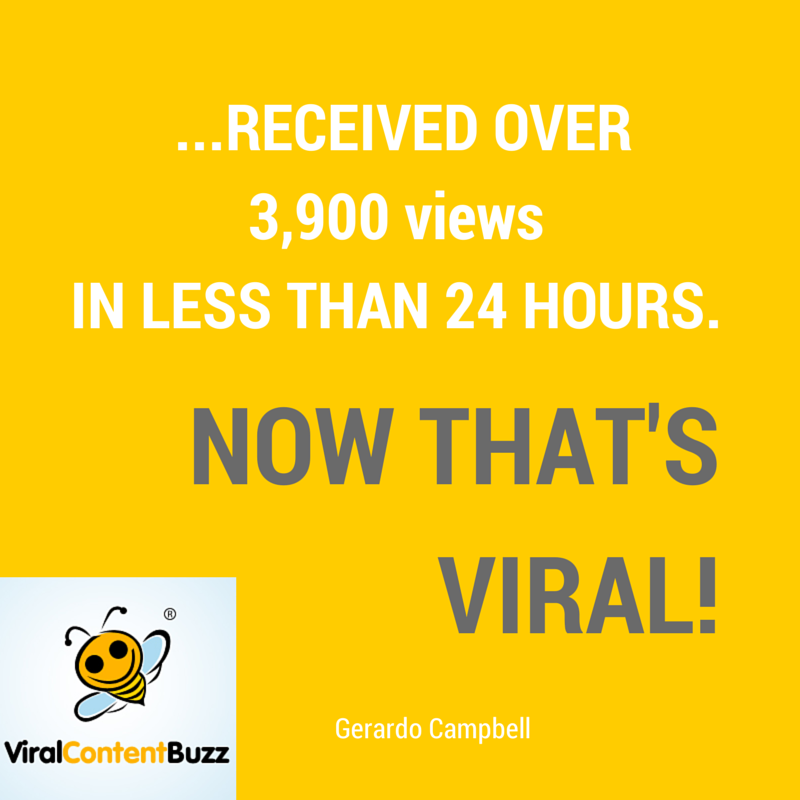 …many of us have experienced the delayed, “Now I have an idea!” moment. That’s been my experience anyway. This community isn’t that kind of pressure which at least for blogging ideas, I like it. Plus I’m big on giving so I look for other requests I can contribute something valuable to. That made me think that we actually somehow re-defined the brainstorming process by making it so relaxed, deadline- and pressure-free, private and, as Patricia puts it, introvert-friendly. With our #mbustorm closing next week (the challenge will be back in November! ), we’ve also had the most intensive feature testing we could ever afford! So the tool will be coming stronger and better in the upcoming weeks! 1. Read the project description carefully and take time to think about that. You don’t need to be an expert in each project you participate in but we are looking for original insights (try not to be too obvious). 3. 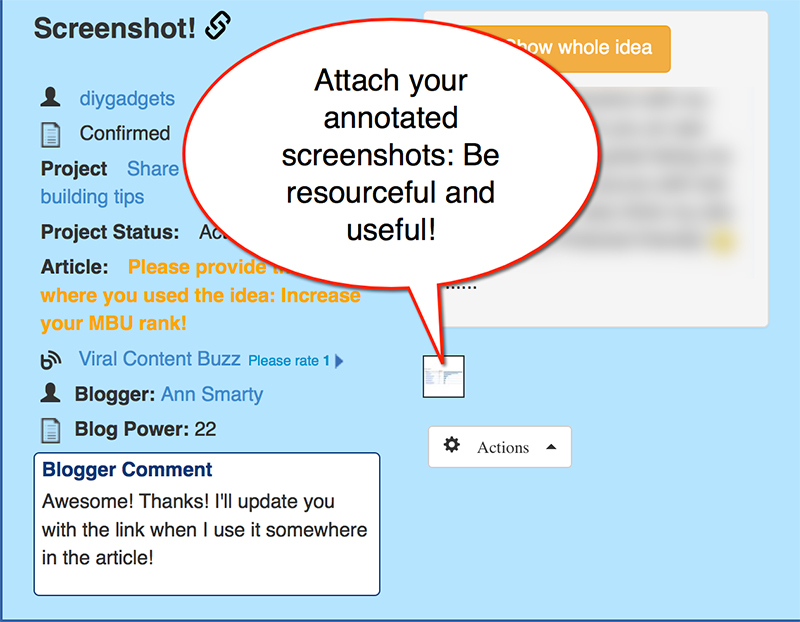 Try to make your idea resourceful: Mention articles, tools, etc you are aware of. Send screenshots in the attachment: Having an idea like that handy will likely prompt the project owner to use it again and again. 4. Feel free to add your name and your personal website and / or social media profile link (don’t overdo of course) at the end. If your idea is a genuine and useful resource, you deserve to be cited: Make it easier to the project owner to find your information to reference you. 5. 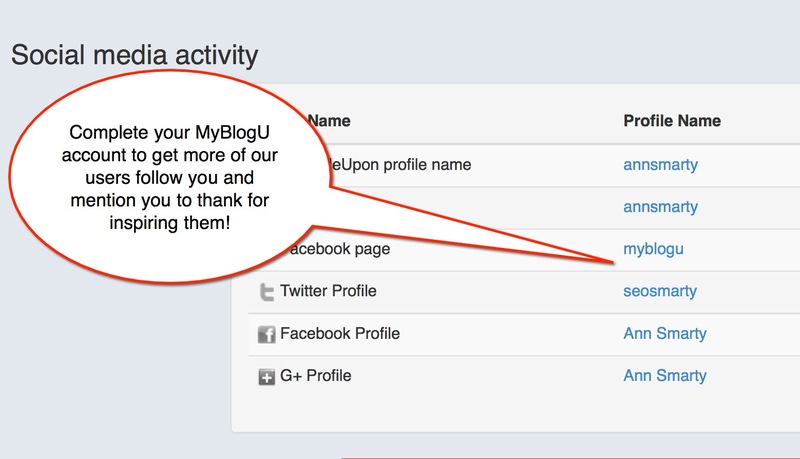 Connect to the project owner on social media and send them a tweet saying you just contributed in their brainstorm (That’s why we encourage everyone to complete their MyBlogU profiles). We do want to help you to build connections here and what’s a better way to do that than through being helpful? I am considering a brand new site, but I’m sick of making ncihe sites designed around gaps in the industry with low kwd competiton research basd trageting…… this new one I want to make will be a blog about real stuff that I personally feel is worth wrtiting about… reall things that I hope people will read purely because the uniqueness, honesty and challenges we face as humans beings living our lives in this challenging world of 2116 and beyond… the topics will be diverse but the common theme will be the focus on deep and neaningful … things like “relationships based on convenience verse relationships based on love”, Are we over stressed without even knowing it?”, Are we cause problems within our family an friends without even knowing it, are we addicted ti things and now even realize it,…. etc etc…. what do you think?